Portland Trail Blazers point guard Damian Lillard (0) dribbles toward the basket during the first half against the Utah Jazz at EnergySolutions Arena. You saw the list of who might win the Western Conference this season, and you know it sure didn’t include the Portland Trail Blazers. Teams such as the Oklahoma City Thunder, San Antonio Spurs, Los Angeles Clippers and Dwight Howard-led Houston Rockets all received top billing. Come on, man. They didn’t even make the playoffs last season. Besides that, there were rumblings that power forward LaMarcus Aldridge was unhappy and wanted out of Portland. Even if Aldridge stayed, did it really mean anything? The Blazers finished 33-49 last season and pretty much returned the entire cast. When you win less than half your games, having a lot of people back isn’t always a good thing. And it’s not like they added Howard in the offseason. Instead, they obtained guys such as center Robin Lopez, ex-Cavaliers guard Mo Williams and second-year forward Thomas Robinson. Not exactly a catalog of NBA luminaries, huh? As for the coach, is there possibly a less-celebrated person in all of pro basketball? Even the staunchest of die-hards might have a difficult time identifying Terry Stotts. So, what gives? How are these Blazers boasting a league-best record of 21-4 entering Tuesday’s lone visit to Cleveland (7 p.m., FOX Sports Ohio)? “Terry is a good coach first of all, but if you look at their roster, they have veteran guys on that team or guys in their prime,” said Cavs coach Mike Brown. The 6-foot-11 Aldridge, of course, is tops among them. He’s averaging 23.5 points, and 10.9 rebounds and was named the Western Conference Player of the Week for the second straight week on Monday. He’s won it three times overall. Oh, in case you’re wondering, he now appears plenty happy in Portland. 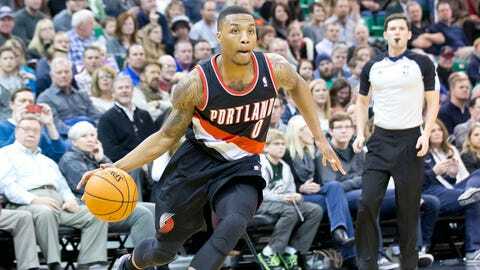 Point guard Damian Lillard, while in just his second season, also fits the profile Brown speaks of. Lillard is the reigning Rookie of the Year and is every bit as good as (if not better than) last year. Small forward Nicolas Batum, shooting guard Wesley Matthews and, yes, Lopez are also playing large roles. Not necessarily huge individual roles — but as a collective unit. This is the third of a four-game trip for the Blazers. They won the first two — pummeling Philadelphia by burying a whopping 21 3-pointers. Then the Blazers squeaked by Detroit on a Lillard buzzer-beater. So they’re winning in a variety of ways and in numerous scenarios. They’re extremely confident, with great chemistry, shooting the ball well and playing slightly more physical basketball than last season. Mostly, they’re just playing intelligent, efficient basketball. Yeah. Even the people who picked the Thunder or Spurs or Clippers or Rockets in the West have to admit that about the Blazers today. • Williams is with his third team since the Cavs traded him to the Clippers during the 2010-11 season. Actually, that deal provided the Cavs with the draft pick used to take Kyrie Irving. “Worked out pretty well for them, I guess” Williams once said. • It’s working out well for Williams now, too. He’s averaging 9.3 points in 24 minutes a game off the bench — for the team with the league’s best record. • Irving, coming off his first East Player of the Week honor, is averaging a team-high 20.9 points and 5.8 assists. • The Cavs have won four in a row at home at five of seven overall. During the home winning streak, the Cavs have held opponents to 41 percent shooting, including a miserable 28 percent on 3-pointers. Meanwhile, the Blazers are averaging 117 points during their last six games. That includes 139 in the route of the Sixers. It’s not often a team scores 139 points on the road these days.